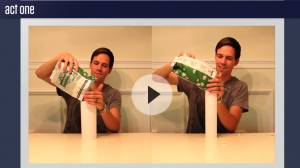 I showed the following Dan Meyer vid to my 8th graders this week as we dove into volume and surface area. a) What’s wrong with the video? Why did it stop? b) Why is he smiling so much? It’s just popcorn! c) Why did he make this video? He has too much time on his hands! 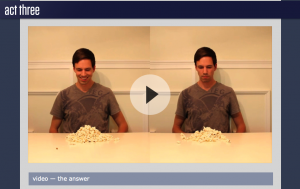 e) I think the same amount of popcorn is in each – after all, the paper is exactly the same size! One student who I was working with one-on-one was particularly curious about the video. Since we weren’t in a setting with a whole class full of kids, I was able to indulge him a little more. “Do you want to reenact the video? What supplies would you need?” At his request, I offered him two sheets of paper, some tape, a ruler, a calculator, and a little bit of breathing room. (No, no popcorn). After taking a few measurements, he admitted he wasn’t quite sure what to do next. 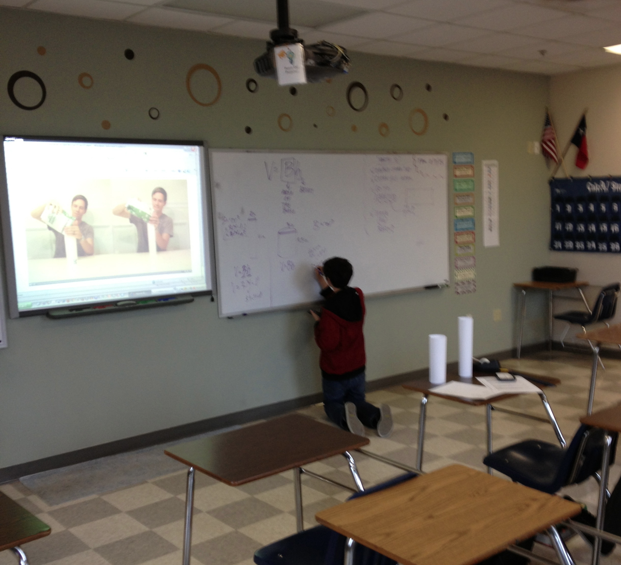 We discussed volume and I sketched a few things on the board to get him thinking, and he was at it again, completing his calculations while literally kneeling on the floor. Clearly, the student was delighted that his calculations matched what happened in the video. This entry was posted in Algebra 1, Pre-Algebra and tagged Dan Meyer, geometry. Bookmark the permalink. Oh yes, the famous “He has too much time on his hands” reaction. This post put that video back into my mind so I am definitely going to give it a go. I like that you added “a little bit of breathing room” to your list of supplies, sometimes we are too quick to jump in with the save.